UW has [http://www.wisc.edu/foodsci/store/ Babcock Hall Ice Cream] on campus which creates delicious ice cream available in the Unions. The [http://www.chocolateshoppeicecream.com/ Chocolate Shoppe], [http://www.ilovemichaels.com/ Michael's Frozen Custard] and Culvers have nice deserts. 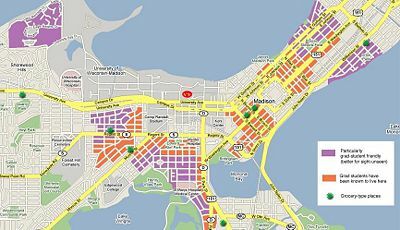 In early September (Labor Day weekend), check out [http://www.madisonfestivals.com/taste/ Taste of Madison] to see many restaurants all in one place at one time. Try a good ol' midwestern Fish Fry on Friday night – All you can eat fried fish generally served with a bran muffin, clam chowder, or coleslaw. Most Brew Pubs and some churches have them, and the [http://www.orpheumtheatre.net/restaurant.php Orpheum] as well at the [http://www.avenuebarmadison.com/ Avenue Bar and Grill] both run Friday night Fish Fries. *[http://www.capcentrefoods.com/home.html Capitol Centre Foods]: Given their small size, they have an excellent selection of groceries. They tend to be a bit pricey. In addition, they deliver groceries. *[http://www.aldifoods.com/ Aldi Foods]: It's like grocery shopping at overstock.com. 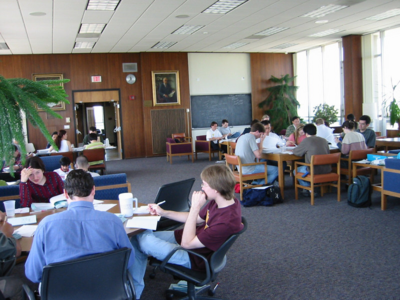 * [http://www.housing.wisc.edu/universityapartments/ University Apartments]: On campus graduate housing, particularly popular with married couples (especially with children). Singles are also welcome. Many of them are on the bus route #80, a free route which runs from the apartments through campus every fifteen minutes throughout the day. * [http://www.housing.wisc.edu/universityapartments/ University Apartments]: On campus graduate housing, particularly popular with married couples (especially with children). Singles are also welcome. Many of them are on the bus route #80, a free route which runs from the apartments through campus every ten minutes throughout the day. Because there is no parking on campus, you will need to plan on living within walking distance of a bus route or campus itself. You will receive a free bus pass for the [http://www.mymetrobus.com/ Madison Metro] system, which is very reliable. Check out the “plan your trip” link to find bus routes near you. * [http://www.recsports.wisc.edu/ Rec Sports] runs the gyms on campus. There are three such on-campus gyms -- The SERF, the Nat, and the Shell, which are free with student ID. For $10/semester, you can attend any of their Group Fitness classes, which cover everything from aerobics and weights to yoga and dance. Also, both the SERF and Nat have indoor pools. *Eastgate, Point and Star Cinema are the three larger movie theaters in town. *Market Square shows second runs at a good discount. *[http://www.bongovideo.com/ Bongo Video] has a smaller, but quite tasty selection. Lots of personality, and good daily specials. It's never too early to start studying for [http://www.math.wisc.edu/graduate/quals.htm quals]... early and often, my friends. Early and Often.